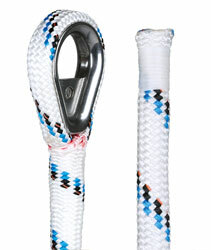 Ropes don´t rust, ropes are light, ropes provides security - not only on the water. In cooperation with our strong partner Gleistein we provide you with smart and complete rope solutions for all fields of application, made of best and long life materials for your individual requirements and specific need. In cooperation with GLEISTEIN, one of the biggest rigging producers in Germany and Europe, we offer you a high-quality service. 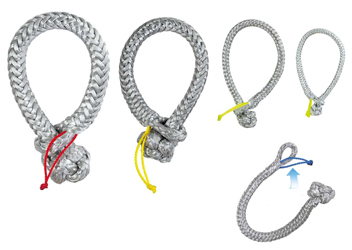 Our professional rigger Olaf Wegmann produces handmade high performance ropes with best fitting splices and rope connections. 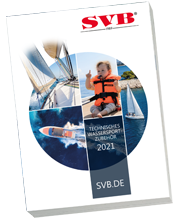 For each individual rigging that we provide for you at SVB, there is a detailed splicing manual. The required tools are available in our online shop. Please be aware of the fact that high performance riggings such as VECTRAN, DYNA ONE and DISCOVER need strengthened thimbles. Therefore web plates are added to nornal thimbles. Our rope rigging are traditionally handmade. Send us the datasheet filled out with your dimensions. Splicing and rigging is a traditional trade, which is still indispensable and cannot be replaced by any modern technology. But, what does the term "splicing" actually mean? 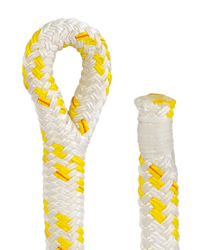 A splice is the tear-and break-proof connection of fiber or wire ropes. 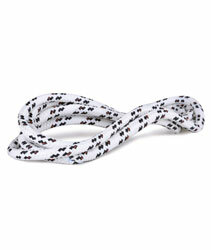 Their individual strands entwine the ropes with each other. 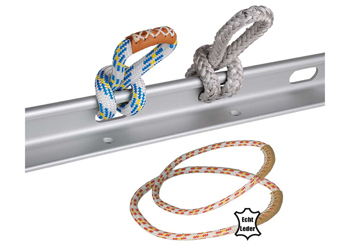 The stability of a splice connection is based on a friction as well as on the phenomena of self-locking and it provides a higher strength than the original rope. The rigger knows different kinds of splicing: eye-splice, long-splice, short-splice and end-splice. "It is a serious mistake if some would try to forget a professional rigger." claims Olaf Wegmann. For 20 years he has been a self-employed rigger and a professional in his field. 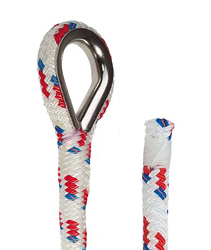 Inaccurately completed splices minimize the breaking strength of the certain rope up to 75%. Regarding this a splice proves to be very useful: A rope, which has been spliced, withstands a burden twice as high as a knotted rope. Many yachts are equipped with oversized lines which are in fact unneccsesary and costly. 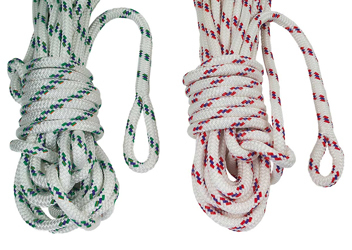 Therefore, professional sailors and racers know about the advantages of spliced ropes and use them to efficiently safe weight and money. SVB helps you to realize your projects! "It can be fatal to think that you do not need professional splices on board" says our expert Olaf Wegmann. 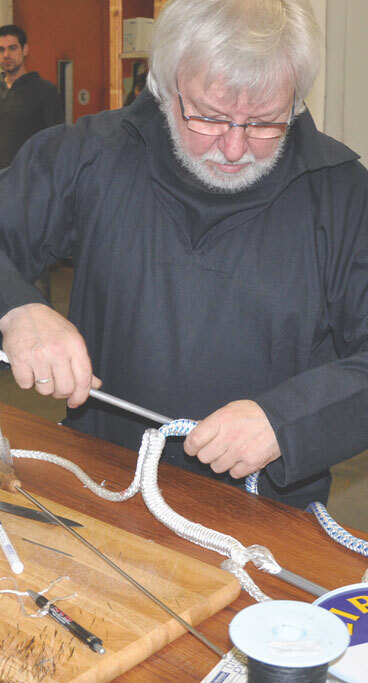 For 20 years now, Olaf is a specialist in the craftsmanship splicing and rigging. Information: daN = decanewton, is the unit of force. 1 Newton = 0.102 kgf, 1daN = 1.020 kgf (or kilopond, approximating 1 daN (10 N) to 1 kg). Note: Our riggers are professional specialists that can give advice and supply all ropes for your boat on your specifications! Eye-splice with stainless steel thimble on 3 strands ropes. For mooring lines, lifting and load lines, security lines etc... Available for different rope diameters. Stainless steel thimble included. The other end is whipped. Stainless steel thimble spliced on a double braid rope (Gemini X, Tasmania etc.). The other end is whipped. Available for different rope diameters. The stainless steel thimble is included in the price. Spliced eye on double-braid ropes such as Gemini X, Tasmania, Harkon, Bavaria, etc. Suits halyards, sheets, contyrol lines, etc. Available for different rope diameters. Other end whipped. 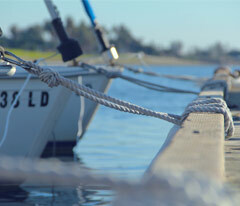 Note: We offer professional advice – we manufacture all ropes for your boat according to your wishes! Beautiful finishing for you 8-strands mooring lines. Lenght of the eye is approximately 50 cm (other dimensions are possible on request). Available for different rope diameters. The other end is whipped. Spliced eye on 3 strands rope. Suits all mooring lines, anchor lines, rodes, security lines etc...The length of the eye is approximately 50 cm (different length possible on request). Available for various rope diameters. Note: Our riggers are professional specialists that can give advice and supply all the ropes for your boat on your specifications! 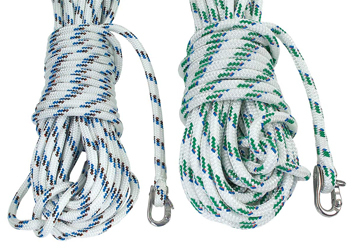 We can splice ropes according to your specifications: two different rope diameters and / or two different rope types. Tailor-made rope for each job! 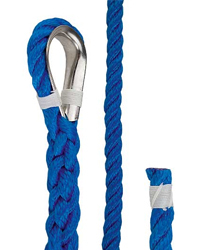 Combine for example a high-quality DynaOne with a cheaper Tasmania or Gemini-X rope. The splices and the ends are whipped. grip - bigger diameter can be used in the "handling area"
ATTENTION! 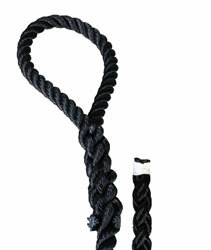 Tailor-made rope means we need your specifications precisely: length, diameter and rope quality. Please note this information in the Comments field of the order or call us at (0049 421 57290-0). Continuous lines spliced on your specifications ! For furling systems, mqin-sheet system (like EASYMATIC), control lines on dinghies... We recommend to use Tasmania, Gemini-X, Harkon or standard rope. Available for different rope diameters. 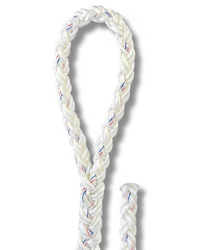 Prespliced halyard with a snap-shackle at one end and whipped at the other end. Available in Gleistein Cup and Dyna Lite, in various diameters, lengths and colors. These sheets are spliced by professional riggers. 10 cm eye on one end and a whipping at the other end. Sold as a pairof one red and one green sheets. Available in different rope diameters and lengths. 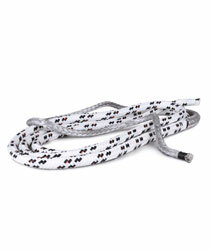 Shackles made of the top-quality product DynaOne ® (pure Dyneema). Thus the shackle offers easy installation and removal. Nothing to screw or bolt. It is extremely light and the risk of injury is significantly lower. Under load, the shackle thightens, and once the load is released it can easily be opened. Available in different sizes. Price per piece. Ready to use loops, Ø ca 15 cm. We take care of the maintenance of your lifejackets and Liferafts.